The Aerospatiale SA315B Lama is a light utility helicopter manufactured by Aerospatiale, Helibras & HAL (Hindustan Aeronautics Limited). 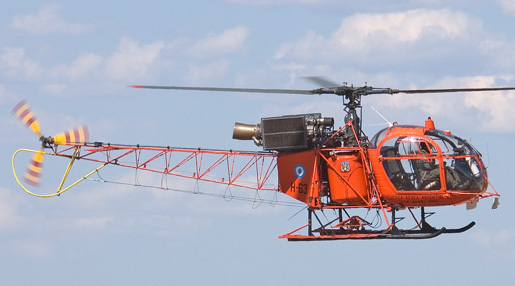 It is a variant of the Alouette II, using that airframe with the more powerful turbine engine form the Alouette III. The airframe has been reinforced for the Lama’s mission parameters, which was to serve the Nepalese Army Air Service and Indian Air Force in “hot and high” conditions. In essence the Lama is a stronger and more powerful Alouette II. As such it builds upon the range of roles that helicopter is capable of. The Lama is useful for observation, passenger transport, sea rescue and ambulance duties. In civilian roles it can also be used for agricultural applications such as crop dusting. The Lama is notable for its high altitude performance, which made it ideal for use in Nepal. In 1972 pilot Jean Boulet set a helicopter absolute altitude record of 40 814 ft. (12 442m). Unfortunately, he was then forced to set the record for longest autorotation, since the engine had flamed out at the peak of the attempt. This reputation cemented Indian demand for the helicopter. Indian assembled SA315Bs, under a special export agreement with HAL, are designated Cheetah and are referred to as such in both the Indian Airforce and Army Aviation Corps. Similarly, the Brazilian manufactured Gavião is also a specially licenced version of the Lama made by Helibras. The Indian-made Cheetah was a key model for HAL. Three decades after its production began in 1972 the company still receives export orders for the helicopter. Making the Cheetah provided HAL with much needed experience and knowledge, allowing it to create its own models such as the HAL Dhruv. HAL has continued to build upon the Cheeta, proposing a modernised variant known as the Cheetal. This variant uses the more powerful TM 333-2M2 engine for even greater high altitude performance. When the HAL Dhruv has issues in operation with the Indian Army it was the Cheetah and Cheetal helicopters that addressed the shortfall. In 2013 the Indian Army placed an order for 20 more Cheetals. In 2015 money the standard Lama cost about $2.4 million when it came out, which would be about $400.000 at the time. Fuel tank capacity & Fuel cosumptions of AS 315 B lama? Do you want to comment the Aerospatiale SA315B Lama helicopter?